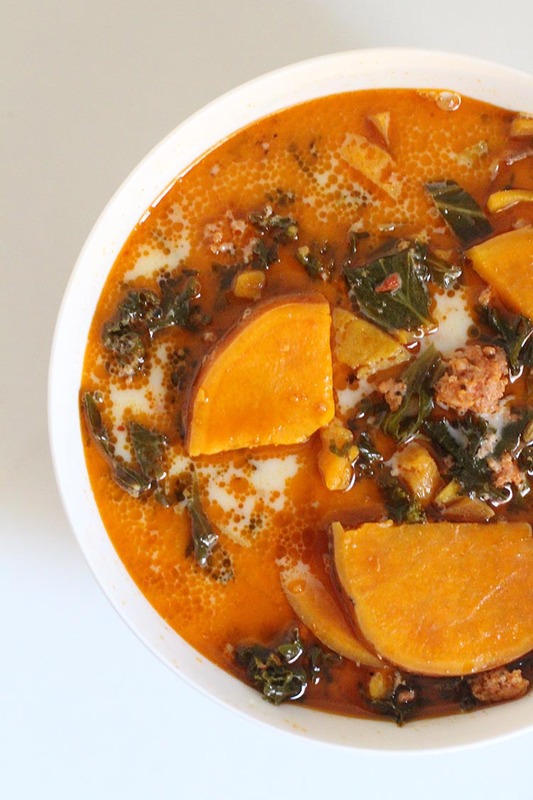 Here’s a recipe for Slow Cooker Zuppa Toscana with Sweet Potatoes that you need to make this week. It’s super flavorful, healthy, and easy to make. A win-win-win! I’m so excited to share this recipe with you because I’ve been making it for YEARS. Two years ago, I shared my first homemade version of The Olive Garden’s Zuppa Toscana soup. I made it on the stovetop and my husband and I decided it was the perfect easy weeknight meal. Last year, I tweaked the recipe to include more user-friendly amounts of kale and chicken broth and shared my updated stovetop recipe. Then, my sister-in-law told me that she loved making it in her slow cooker with sweet potatoes and I knew it needed yet another update. 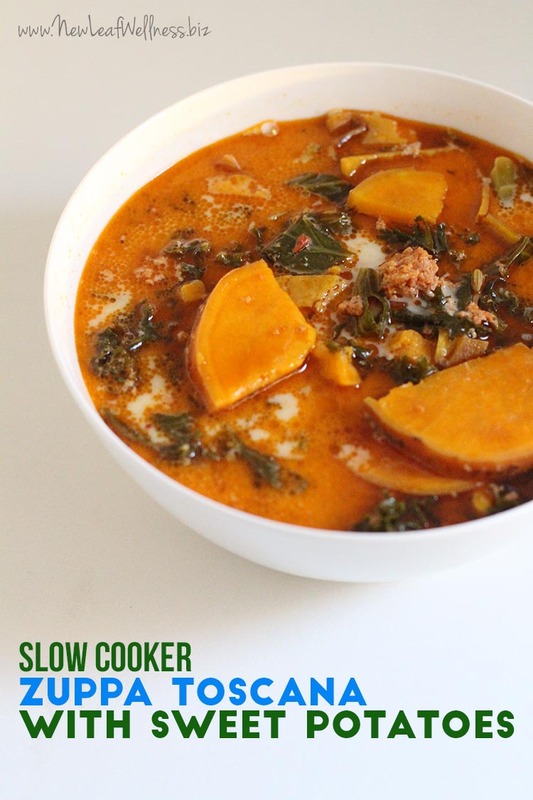 My husband and I ate this version of Slow Cooker Zuppa Toscana with Sweet Potatoes for dinner last week and decided it’s the best version yet! If you buy a three-pound bag of sweet potatoes I highly recommend doubling the recipe and making one for dinner and freezing a second bag to cook later. Trust me – it’s THAT good. The combination of spicy sausage, sweet potatoes, and spices is to die for. 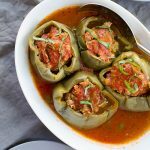 In my world, easy recipes that taste delicious are kind of the best thing ever and this is one of them. Add some bonus points for fresh veggies and you’ll be making this recipe for years to come too. Enjoy! Break apart the sausage and add all ingredients to your slow cooker, except the heavy cream. Cook 8 hours on “low” setting or until sausage is cooked through. Add heavy cream and stir to heat through. 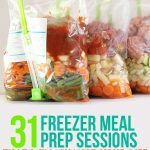 To a gallon-sized plastic freezer bag, add all ingredients (except chicken broth and heavy cream. You can freeze the cream in a separate bag or wait to buy it until you’re ready to cook the soup). When ready to eat, thaw. Dump bag into slow cooker and add chicken broth. Cook for 8 hours on “low” setting or until sausage is cooked through. Break apart sausage and add heavy cream. Stir to heat through. Serve with fresh bread. YUM. Are you saying that it never contains dairy? The one at the Olive Garden does and so do a ton of other recipes online. You are welcome to omit it if you want though. Thank you for your kind words and feedback! I’m certain all the dishes at Olive Garden are Americanized. I’m so excited to try this recipe! 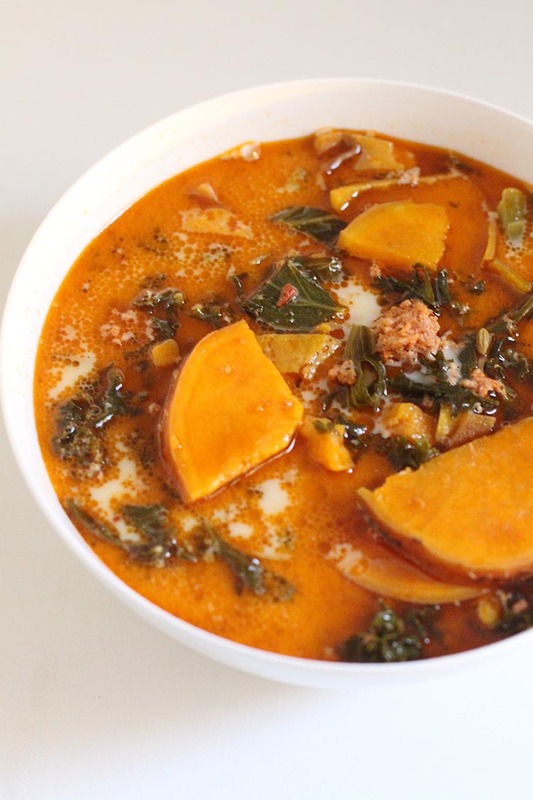 I love Zuppe Toscana and have had it many times and to add the sweet potatoes?!?!?! Yummy! I cook them exactly as listed on my site or in my books. 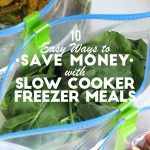 For that slow cooker, I usually cook chicken recipes for 3-4 hours and everything else for 6 hours. I use ground sausage and add it raw. If you haven’t received the eBooks yet, email me at kelly@newleafwellness.biz and I’ll send you new copies. Thank you for your support! 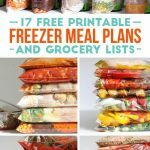 I would love to use your freezer meals as I am facing surgery again on my leg and I’d like to plan ahead of time, but My WHOLE family can not have ANY form of dairy foods so could i just leave them out or is there some thing else I could use in their place please? I realize this is an old post, but we use canned full fat coconut milk in place of all dairy and just add a bit more salt to counteract the sweetness of the coconut milk. I use canned coconut cream whenever a heavy cream is called for.